It actually seems impossible to finally be writing the introduction for Space Opera as this project was first conceived three years ago when Chivalry & Sorcery was first released and has been in the works since 1978. Over two years in the works and involving a design team that stretched from the Eastern U.S. to Western Canada and finally to the heart of the cutback of Australia, this is a truly international design group on a truly interstellar scale. The original concept was to create a game that would not need the usually innumerable supplements to its rules but that would be a complete science fiction rote playing game. 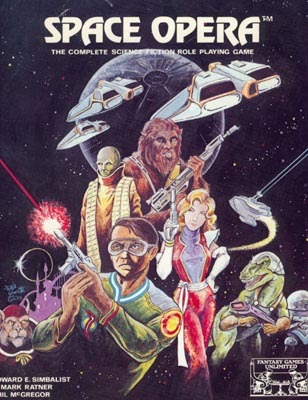 Thus, we wanted a game that would allow players to role play all of the most popular roles for characters in the entire genre of science fiction literature. This called for a game to handle the future warrior and mercenary, the free trader, the asteroid miner, the planetary explorer and first contact man, and the member of the diplomatic corps/spy service. We needed science and the possibility of scientist characters with medicine playing a major role. As if this were not enough, the decision was made to base the game on the grand tradition of Space Opera, in the vein of E.E. Doc Smith and most recently Star Wars from George Lucas. This meant that we would also have to allow for the psionic powers so prevalent in the Lensman series and in Star Wars with "the force".